This week’s the last of my writing class and boy what an adventure it has been. I’ve always loved to write, it’s partly why I became a journalist. In the past several months I began to crave writing something for myself, so I started She’sWrite. 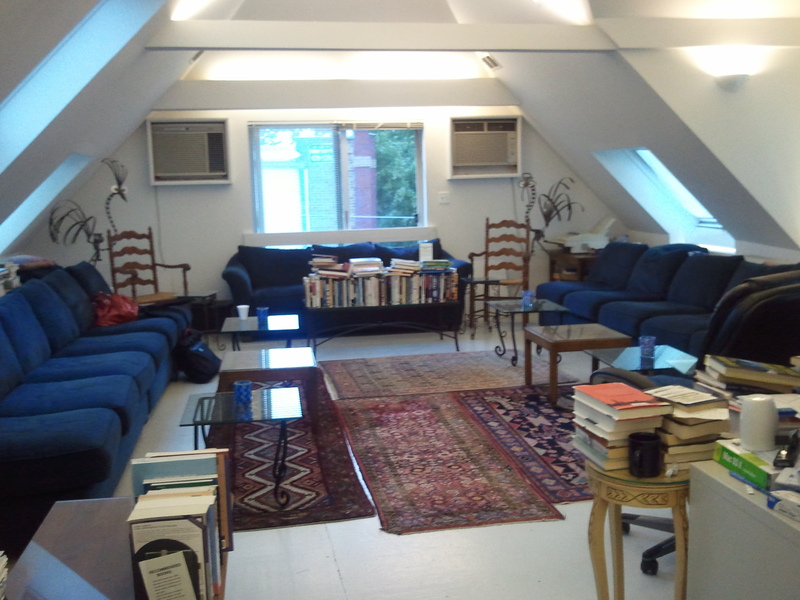 Here's the loft where our group of 12 met each week. Amazing stories have been told in this room. Blogging was so much fun, I flirted with the idea of stretching my writing. After a bit of Googling, I stumbled on a workshop that spoke to me. It was about empowering writers to write better. I called and talked to the teacher, Jerry, and we chatted for a good half hour about writing and I was sold. He was exactly the kind of adviser I wanted. Smart, honest, kind. My first session, I was very nervous, wondering what the people would be like, whether I’d have to read my writing aloud. Scary stuff. My group was varied. Some had written books, others screenplays. One woman who oozed Zen was a songwriter and poet. When we introduced ourselves it was inspiring to hear all the reasons people joined the workshop. They were prepping for their MFAs (Master of Fine Arts), dusting off an MFA, trying to get published, finishing their second novel, etc. Me? I gave a very articulate reason for attending: “I just wanna write.” It was followed by a sheepish shrug. Not so impressive, but it’s me. I learned a lot from the workshop and Jerry gave us the tools to keep growing. Some of us are forming a writing group that meets regularly so we can keep up the creative momentum. Honestly it’s somewhat good the workshop is over because with work, our commute and Logan, it created many scheduling constraints that aren’t sustainable long term. Thankfully Hubby bent over backward to fill in the gaps. Still, I’ll really miss my Wednesdays. I’d get off work, scramble to the Lakeview neighborhood on the city’s North Side and pick out one of the must-taste restaurants on Southport Avenue. I did Tango Sur, Blue Bayou, Fridas (twice) and Coobah. There’s something liberatingly serene about having a table for one. So that’s it. I’m leaving the writer’s loft, but at least I’m taking a little bit of it with me. This entry was posted in Appetizer for Life, Writing and tagged Chicago, restaurants, southport, writer's loft, writing workshop. Bookmark the permalink. I need to find a writing group or workshop like this! I’m so glad you enjoyed it. How wonderful!!! I will be joining his class tomorrow and I am more then excited to see what he has to offer!!!! !